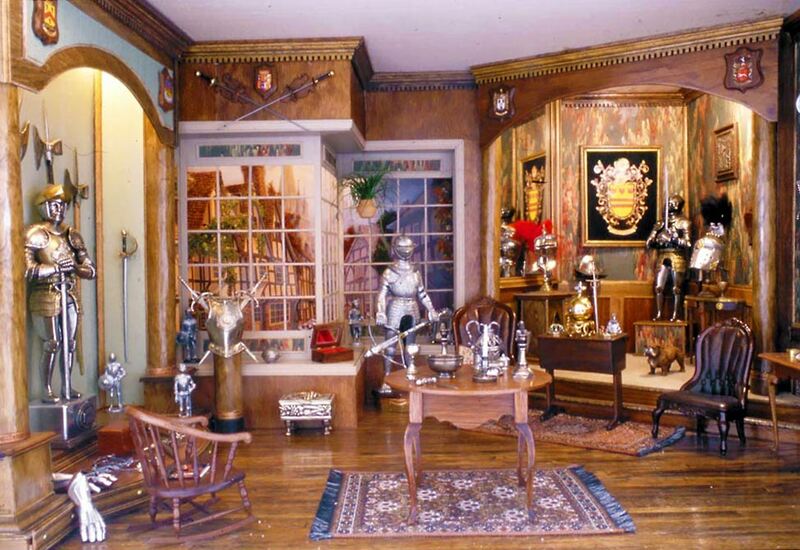 The home and garden of creative artist Patricia Peat is a magically enthralling retreat. 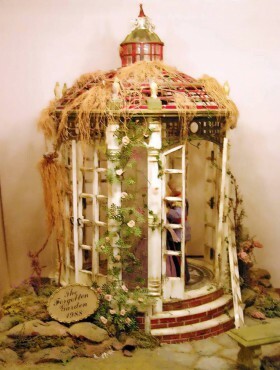 She is not only known as an artistic gardener but also for her miniatures, her jewelry and her stained glass creations. 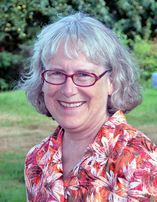 In addition, she volunteers at the Kitsap County Historical Society, where for more than a decade she’s been creating storefront displays to best feature the artifacts in the society’s collection. When the Peat family home was under construction, neighbors would stop by to guess why the front wall in the entry hall had numerous rectangular holes cut into it. Many speculated that Patricia and her husband, Chuck, were going to install multiple fish tanks. 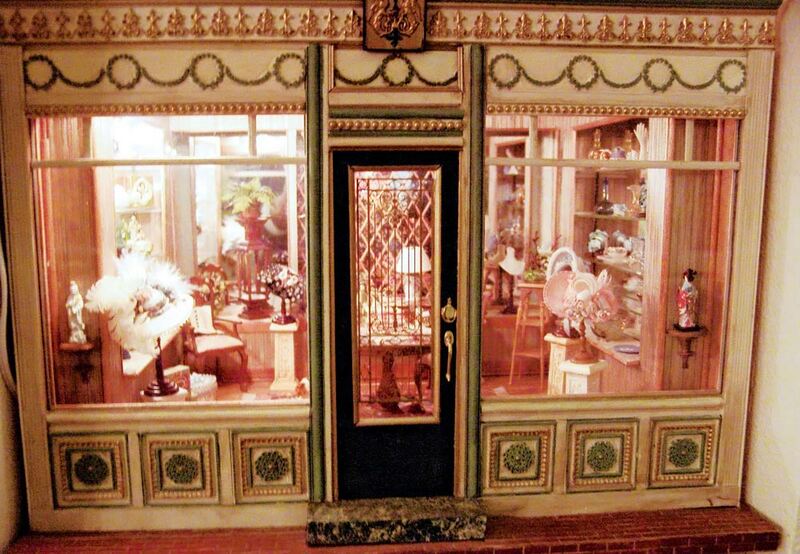 No one imagined the wall would display the exquisitely detailed miniatures created by Patricia over the years, beginning in 1984. “I designed the wall and it drove the builders and sheet rockers mad. Each box has its own power source,” she says. 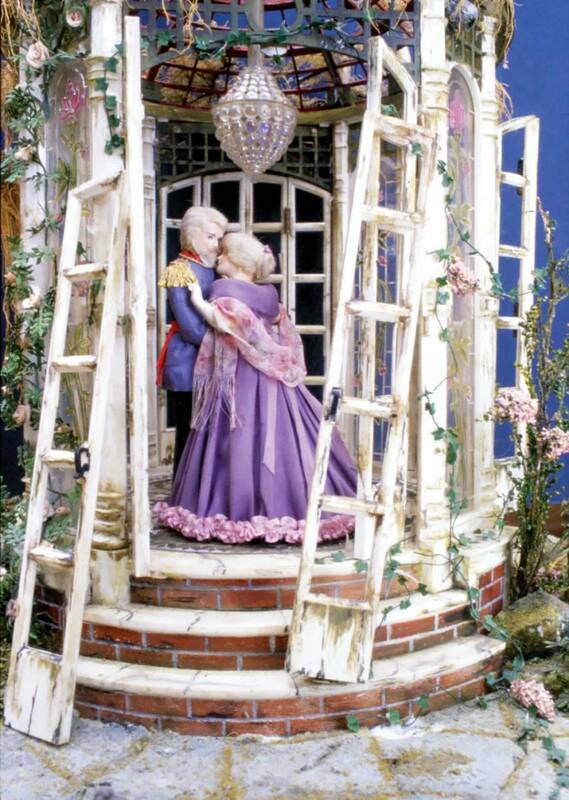 Peat’s journey into miniature creating began as a gift to delight and entertain her mother, who lived with them. “This is how many people begin,” she says. 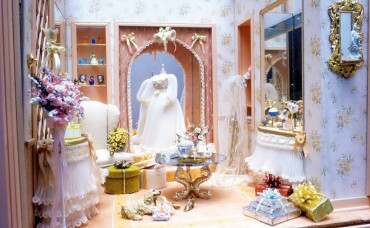 Peat’s mother grew up in a time when she had few toys and didn’t have a doll house or dolls. The miniatures pleased her tremendously, and Patricia and Chuck had so much fun creating and collecting the pieces, they became enthralled by the hobby. 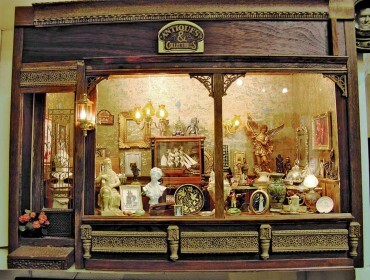 Patricia’s mother and her husband have since passed away, but their memory, the creations and collections live on daily. 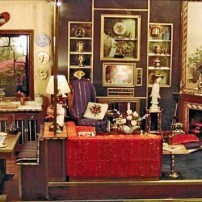 Nearly every miniature vignette Patricia made has a photo of Chuck and their daughter, Wendy, incorporated into the setting. It’s fascinating to explore each tiny world and discover where the eye will light upon Chuck or Wendy’s image. The miniature vignettes still speak to Patricia every day, as she remembers why and how they were created. The couple lived in Japan for several years and Chuck’s Navy career took them all over the world. Upon retirement, they continued to travel and explore. 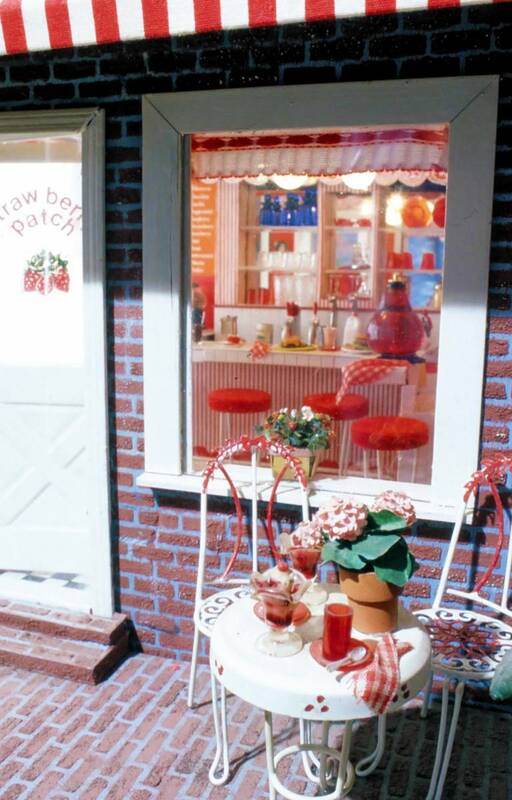 “It was fun to collect small, packable things, just right for collecting miniatures,” Peat says. 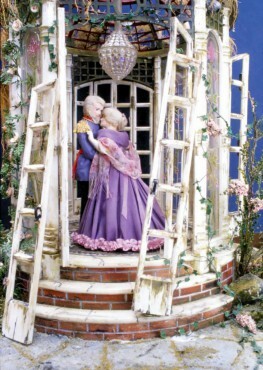 Many techniques are used in creating miniatures. Rugs and tapestries are photographed onto silk. There are also artists who weave minutely stitched and woven rugs and fabrics. 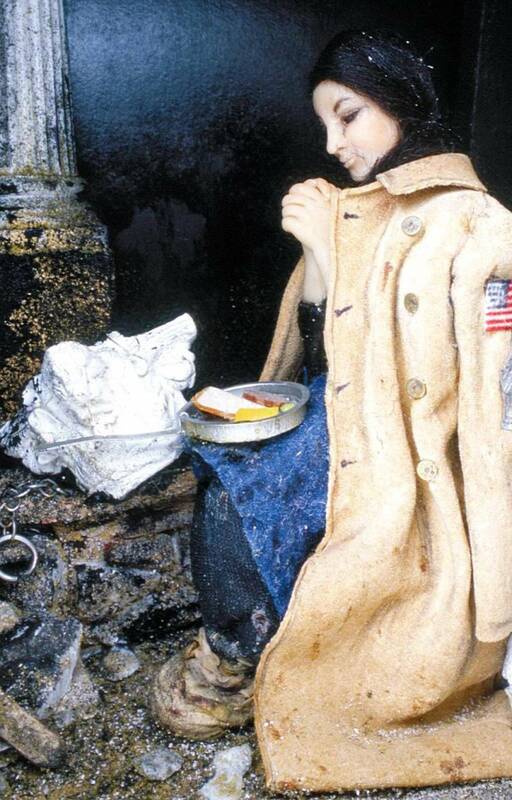 Figures and teensy dolls are made out of femo, other special clays and porcelain. 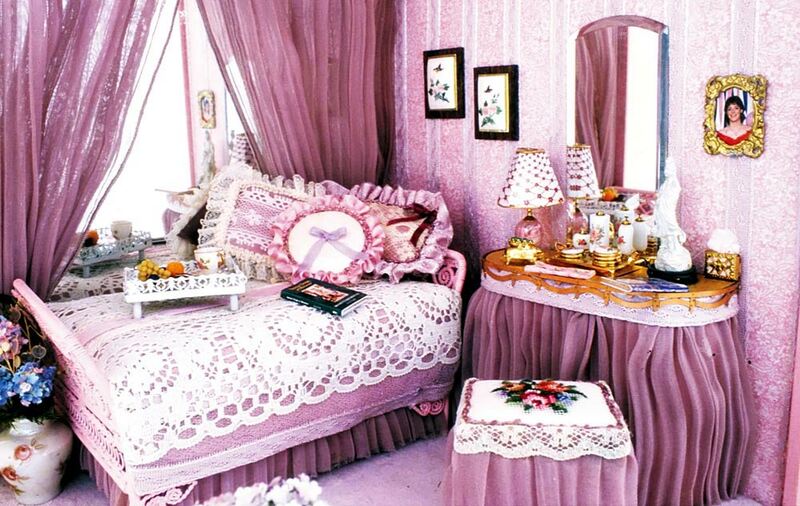 Fabric on dresses and drapes in the rooms would not hang in a realistic manner because of their size and weight. Each costume and window covering must be sprayed or painted with a fixative to keep the fabrics folded and draped properly and permanently. 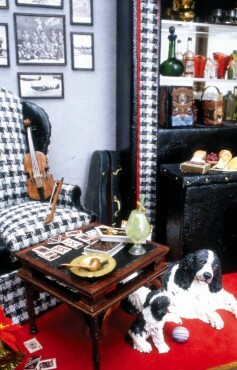 Books, cereal boxes, wallpaper and other appealing and useful home décor items begin as full-sized pieces placed strategically and then photographed. The photos are then peeled off and affixed to tiny boxes, to walls and to other items to create images from real life. Peat explains you never know when you might need a piece of this or a piece of that. 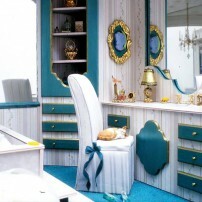 Even old clothing becomes upholstery for a sofa or some other piece of furniture or décor. 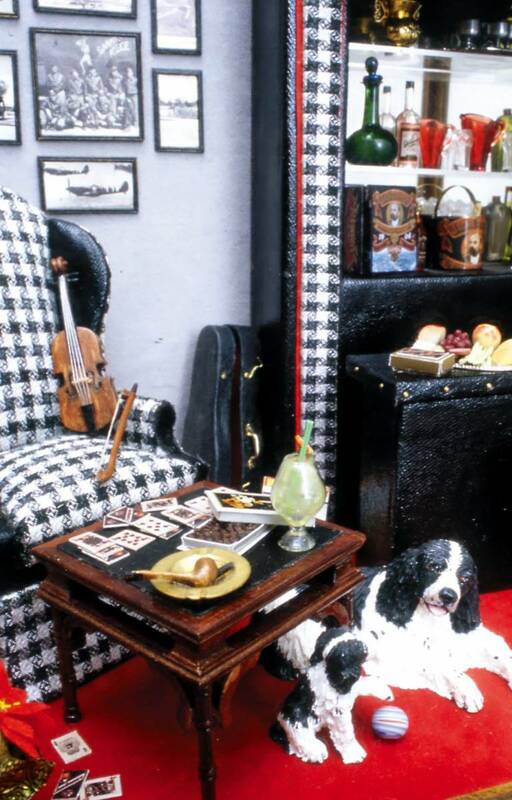 “This hobby takes up a lot of room; you don’t throw away anything,” she says. Patricia Peat created this “Safe Harbor” room to honor her husband, Chuck. One of Peat’s creations is a Norman Rockwell illustration from a “Post” cover. Her mom had found it in a book, so Patricia created it for her. Unfortunately her mom did not live long enough to see the completed room. 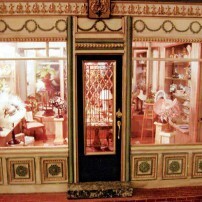 The miniature was on display at a show in Ballard several years ago. 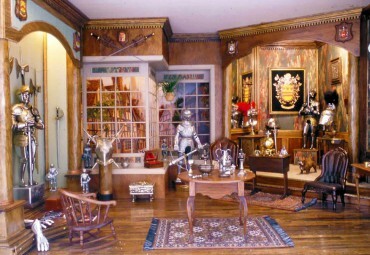 One miniaturist returned again and again to closely examine every detail. He finally told Peat she’d missed a tiny speck resembling a cufflink in the original “Post” cover, which was also part of the display. Sure enough, in the cover there was a small speck that looked like a cufflink. Peat has since incorporated this tiny detail into the display. Some vignettes are mirror images or have mirror images in them. “That’s one of the hardest things to do,” she says. Peat has not created miniatures in a while. 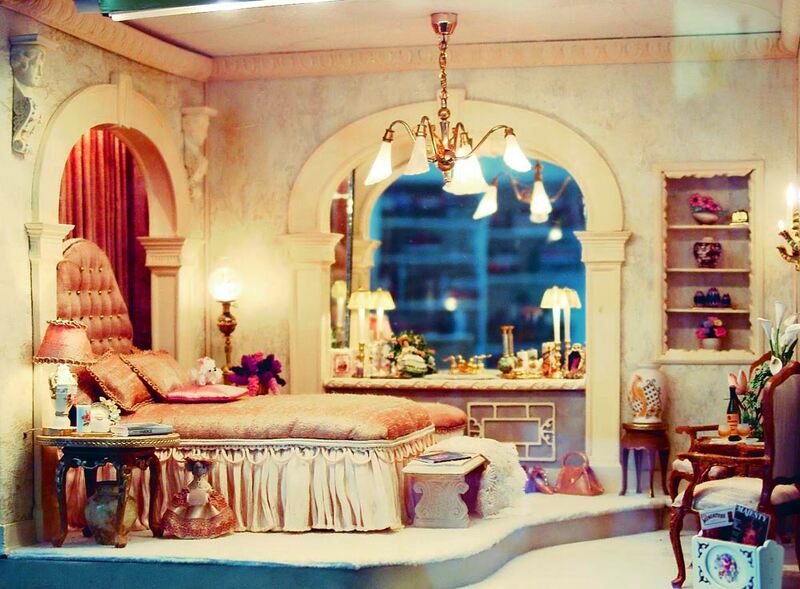 “I will probably someday return to doing miniatures; I have all the tools and supplies,” she says. But at present her other creative endeavors include her garden, creating full-sized historical shopfronts, stained glass and, most recently, making gorgeous pieces of jewelry. Bill Fuhrmeister is the carpenter volunteer who’s helped Peat create a whole street full of storefronts at the Kitsap Historical Society in downtown Bremerton. So far the team has created a fire station, dentist and doctor’s office, a school house, general store, dress shop and Moeller’s Jewelry Store. 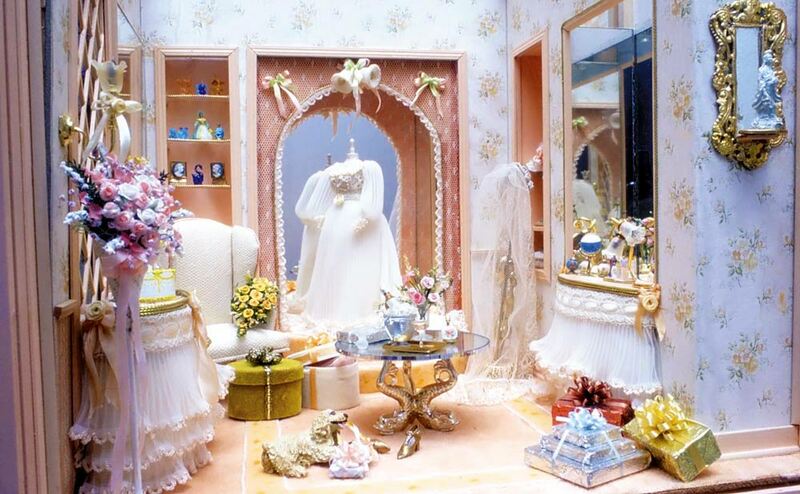 In the dress shop, the dresses are changed with the season. A brick street wends its way through the shop fronts. Bob Kimbel from North Kitsap installed the bricks. Peat says it’s taken 11 years to create and install the street, where visitors to the museum can step back in history. 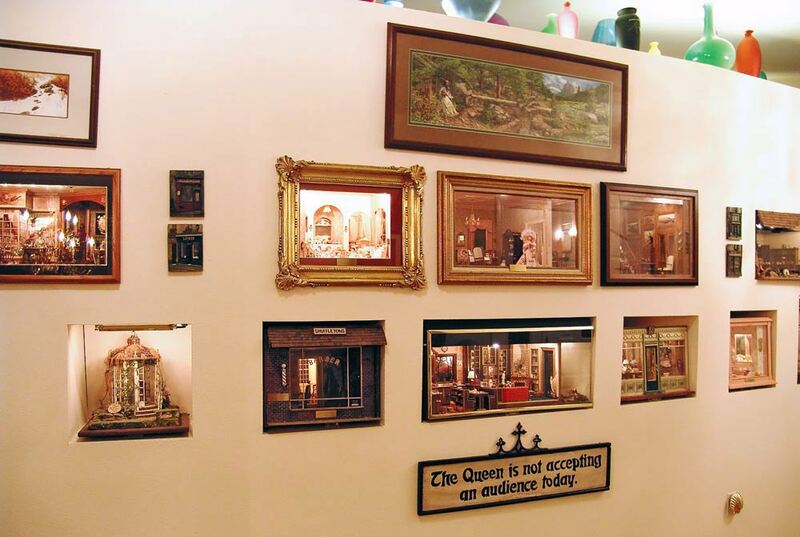 She’s taken all her talents creating miniatures and enlarged them into the displays at the museum. Designing and making jewelry is Peat’s latest passion. She loves semi-precious stones and was having difficulty finding the pieces she wanted or had wanted to find. So, she started reading books and taught herself jewelry making. Peat’s creations are found at local craft events; she also does private showings by appointment and likes doing in-home parties by arrangement. 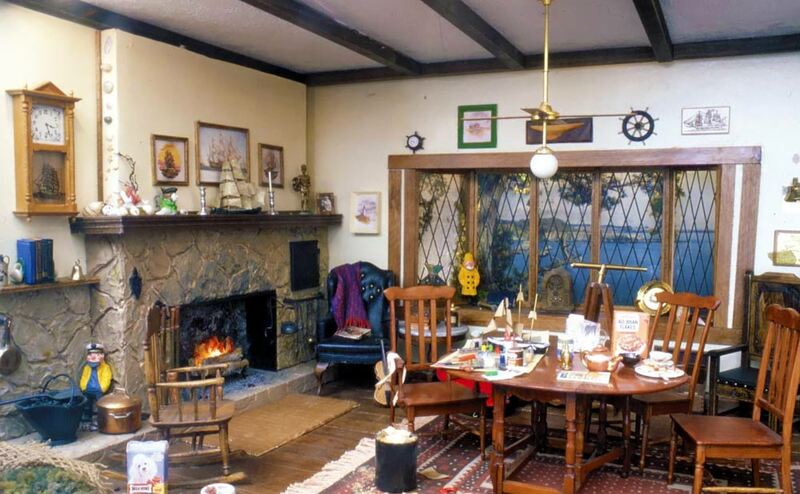 One whole room of her home is festooned with strings of beads and jewelry on display. 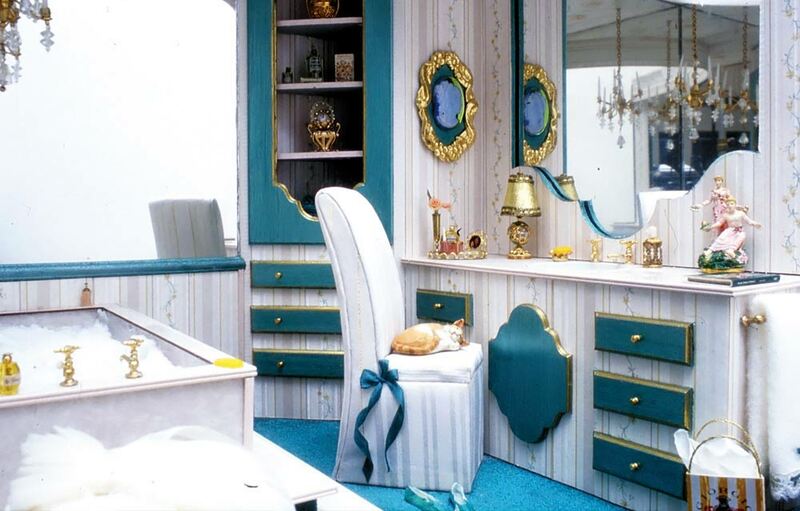 The room is a feast for the senses, with an ever-expanding array of colors and textures. The “Forgotten Garden” was built using a music box as a base. She’s designed pieces for brides and some people have even purchased her designs right off her neck. “I was at an event and someone purchased the piece I was wearing,” she says. Some of the stones available are jade, turquoise, amethyst, amber, fresh water pearls, carnelian, jasper, agates, coral and shells. Peat says, “Each strand is personally handpicked at gem and jewelry trade shows and from international dealers.” She uses sterling silver, vermeil and gold-plated findings. Every piece is 100 percent guaranteed and will give a “lifetime of pleasure” to the wearer, she says. Peat’s company is called Bagatelle. 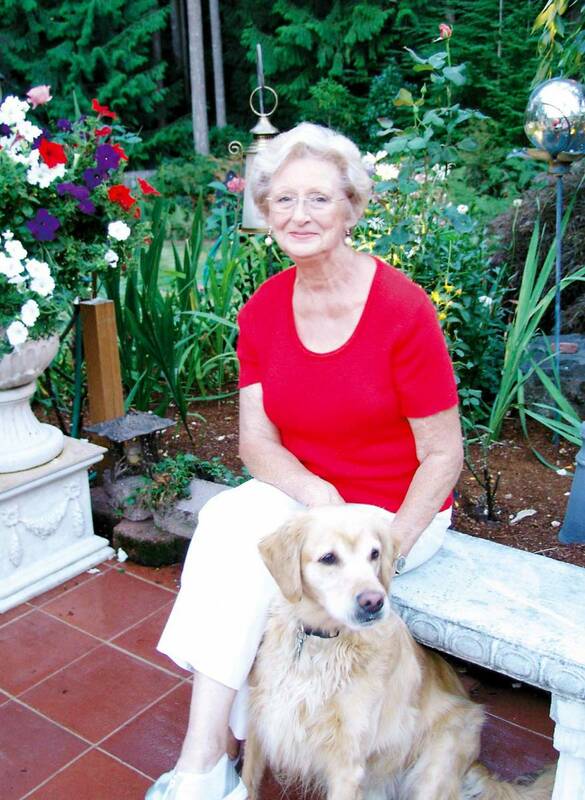 A love of art and things beautiful and charming has provided a continuing outlet for her artistic talents. One of her miniatures is called “Safe Harbor” in honor of Chuck. 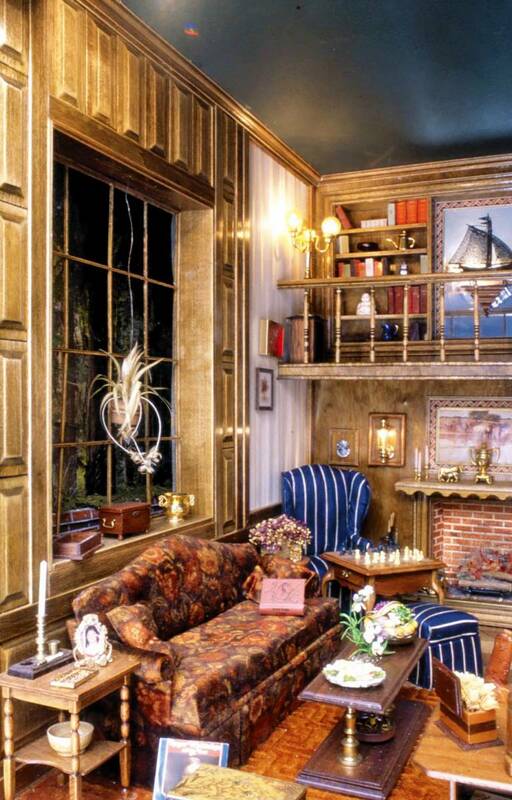 The vignette reminds viewers of a ship captain’s sitting room looking out on the harbor. Every piece in the miniature evokes calming feelings. 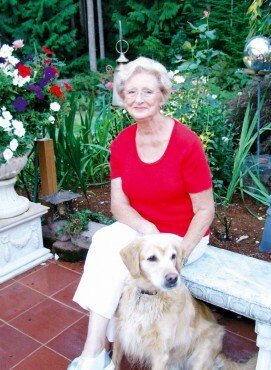 Peat’s home, garden, jewelry creations, community service and the miniatures all personify the safe harbor of her own life.